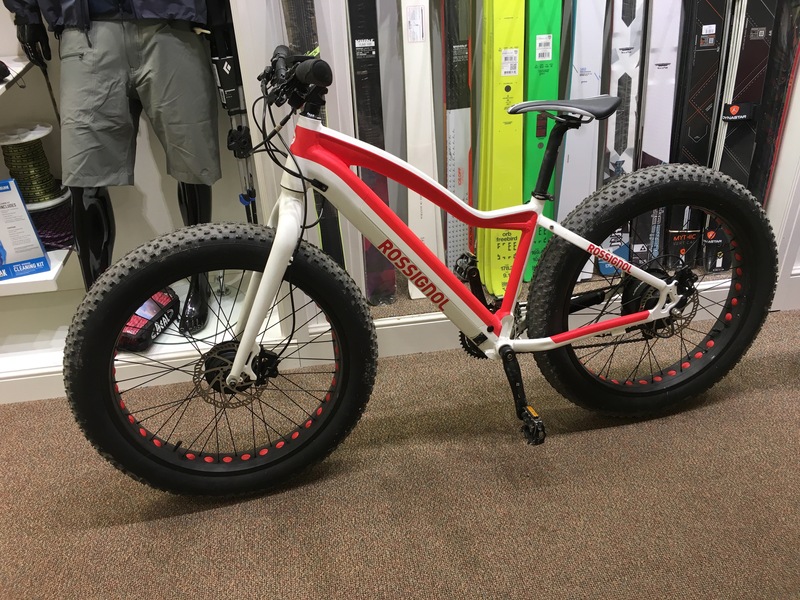 This little beauty is an E-Fatbike. 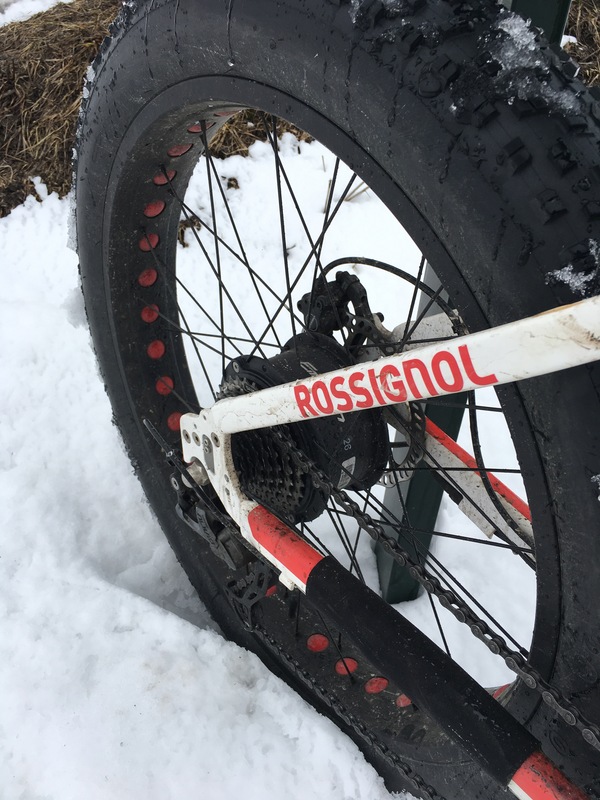 Now it’s obviously a publicity machine as Rossignol wouldn’t be the first manufacturer you would think of for a bicycle, but the ski equipment company did buy Felt bicycles earlier this year. 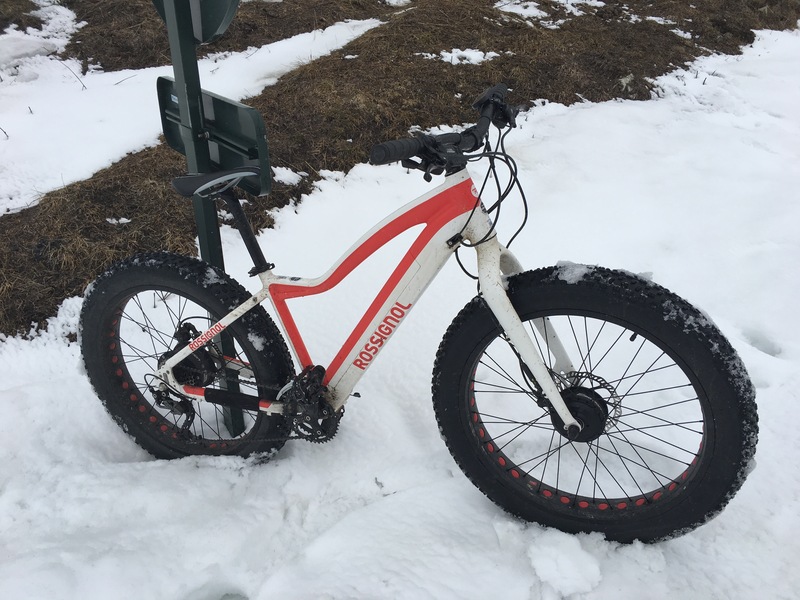 The 7G FAT-BIKE as it is know is a do it all mountain machine. Read French? Click here for the spec list. What I can tell you is that it’s a two wheel drive, 4″ tyred, xt equipped, disc braked bundle of fun. 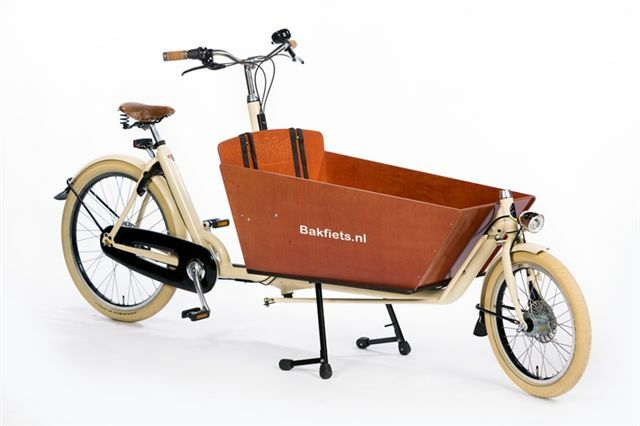 It handles a little barge like but that’s down to the double motors, as soon as you stop pedalling (or wind down the level of pedal assist) it handles more traditionally. 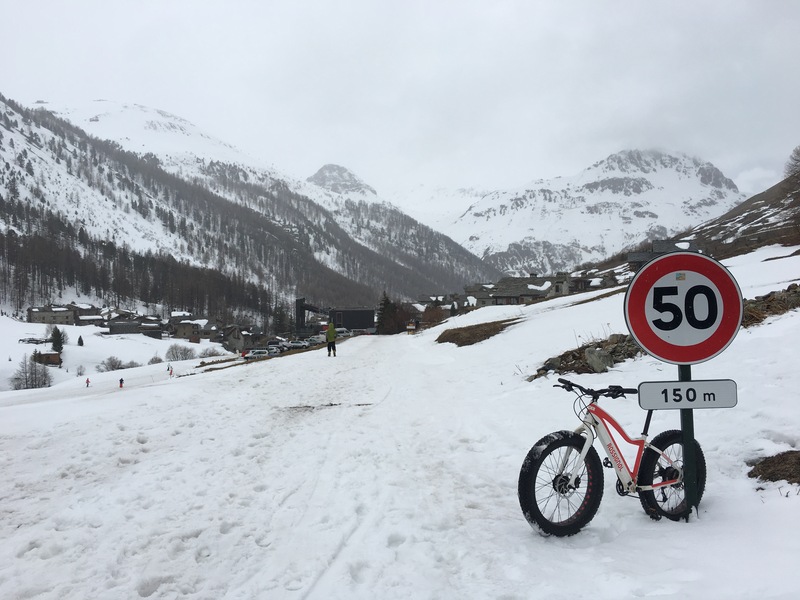 It’s not light, but what ebikes are? But I did manage to pop it off the ground occasionally. 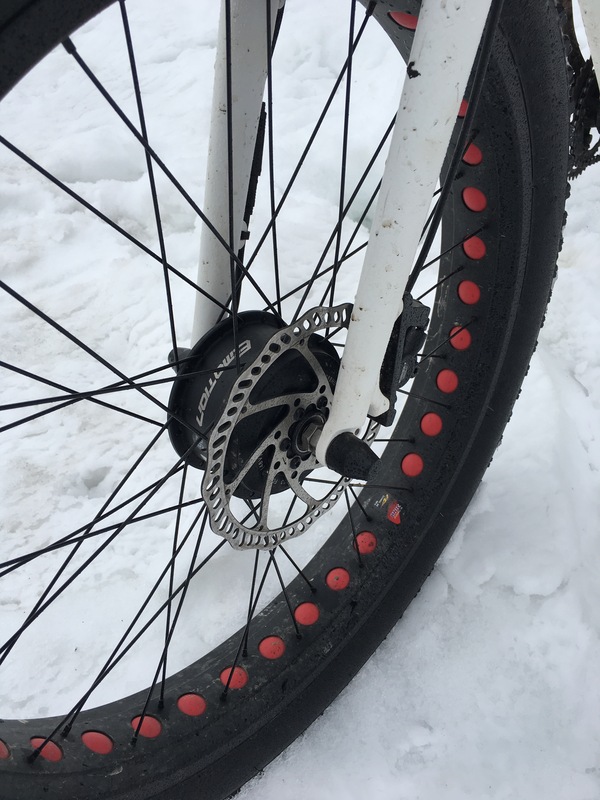 The brakes were more than powerful enough to lock the wheels and had good modulation, which was very handy when pulling up on snow and ice! The gearing comes from shimanos stable and was faultless so no issues there, not that you really need gears with the pedal assist whacked up to full power! The bike will hold a steady 19mph, which is 4.5mph faster than uk law allows, and that’s quite impressive. Although on tarmac it sounds like you are driving a tractor! The assist feels pretty natural and you can adjust from ‘just enough to make the bike go’ to ‘completely effortless’. The 7G struggled in the late season snow conditions, they were super slushy. This could have been down to high tyre pressures and too much pedal assist, I just seemed to wheel spin. It could also be my more than aggressive riding style though, too high a gear and too hard a pedal stomps. I would like to try it again with a little more time on my hands, and firmer snow conditions. Hey why not throw a summer test up the ski runs as well? As fat bikes (and ebikes) go the 7G is pretty sleek, the battery is integrated into the frame and the hub motors are quite small. It doesn’t have that ebike look about it, just a chunky alloy frame style. Graphics are pretty sedate though, but like I said it’s made for publicity. Would I go out and buy one? If I lived in a ski resort? Without doubt. You would get some great winter training in. 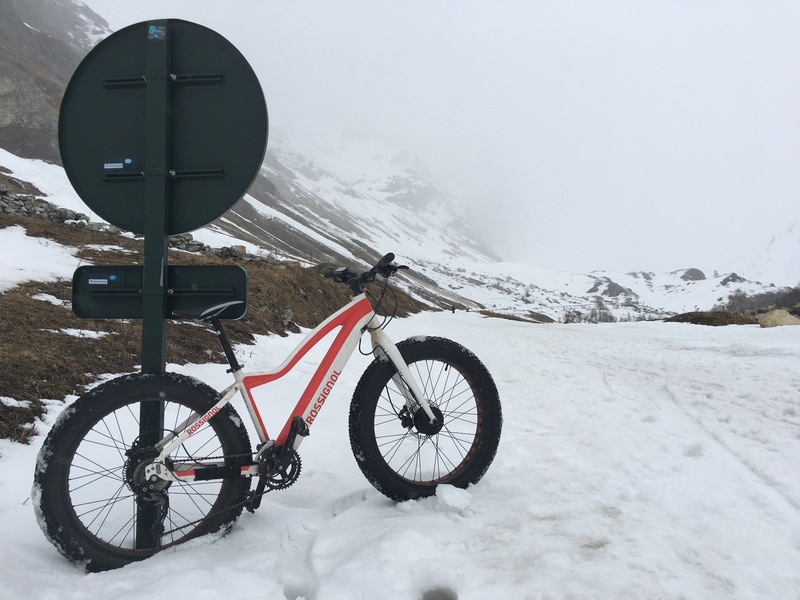 I can now see the appeal of fat bikes, they have a great ‘go anywhere’ feel, even if you do look like John Wayne when you are riding them! I’d like to try a lightweight non ebike version to see how they compare, just to see if the assist is the reason it was so much fun! Here are some more shots of the 7G!